World-class wheelchair athlete, James Lilly, didn’t take ‘no’ for an answer when gang violence left him paralyzed at the age of 15. His perception of his own disability began to change, as he realized that his struggles and frustrations were experienced by others. He set out to conquer both independence and a sense of his own fulfillment by becoming a motivational speaker and sharing his story to the inner-city school kids. When speaking with James, it’s easy to overlook the fact that he uses a wheelchair for his disability doesn’t define him. The passion and power behind his words creates a sense that one can do anything they put their mind to no matter what their ability level. He will be the first to tell you that fitness and sports, specifically wheelchair racing, got him through his struggles and helped him to realize that he could inspire people with his own story, telling of the adversity he has overcome and encouraging others to reach their fullest potential. James has and continues to compete in countless races and also coaches junior wheelchair track and field teams. He recently won the RIC Lifetime Fitness Achievement award at the Sports and Fitness banquet. His speech at the banquet left everyone in joyful tears as he explained that you don’t have to be a world-class athlete to add satisfaction and fulfillment to your life. You simply have to define what is meaningful and enjoyable to you and go with it in full force. Moreover, you have to take the word can’t out of your vocabulary. His story serves as a reminder to not doubt our own capabilities despite the seemingly encumbering obstacles we feel may limit us. With regard to fitness and maintaining an active lifestyle, it can be intimidating and at times frustrating when we feel we are limited by what our bodies can handle. As a result, we might lack motivation and our self-efficacy, or belief about what we can do, diminishes. Most individuals know that exercise is good for the body and mind. Physically, it can improve functional capabilities, bolster heart health and decrease our risk for injury. Mentally, physical exertion can cause a release of endorphins, helping us to focus, relax and feel better in general. So if we know that exercise is a good thing, why do we often resist it? Individual reasons vary, but a few include not having enough time, having too much pain, not having the right resources (i.e. a gym) not knowing what to do or how to do it, and simply finding it uninteresting or not enjoyable. Maybe you used to work out a great deal but over time have strayed from your routine and can’t seem to get back into it for one reason or another. Here are two suggestions to consider in response to these issues: First, work on setting realistic goals that are progressive in nature. This means that your goals will build off of one another. For instance, try to increase the distance traveled on the bike, treadmill or nustep a little bit each time, working towards a certain self-set, pre-determined distance. The next workout, build off of the goal you set before, seeing if you can travel a little further so that your muscles continue to be challenged. The second suggestion is to figure out what you like to do to stay active and try to integrate that into your daily activities, modifying it to your needs. If you set a goal of riding a bike 30 minutes every day yet you despise riding bikes, chances are that you’re not going to keep up with it. Maybe a more realistic goal would be allowing 20-30 minutes to take a stroll around your neighborhood with a friend. It may be more appropriate for some people to work out in increments of 10 minutes here and there. All are considered forms of exercise, and ‘yes’ it CAN, and SHOULD, be fun! The most important aspect to recognize is not what you can’t do, but what you can do, and going forward from there. There are many opportunities to activate your lifestyle and become a member of the community. 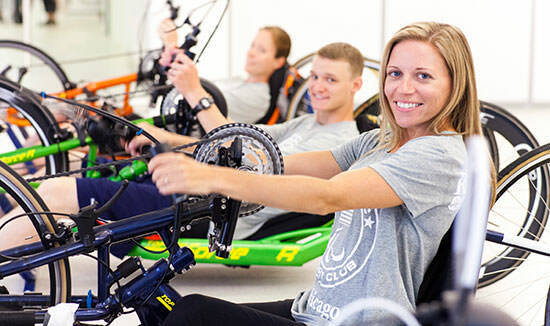 From wheelchair adaptive sports such as archery, basketball, softball, sailing and more, to a variety of adaptive aerobic classes and recreational opportunities, there are many outlets worth looking into. 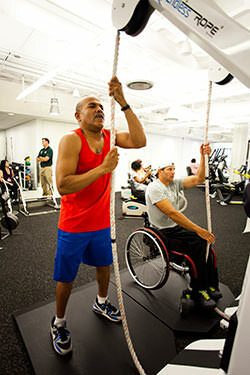 Working with RIC in the fitness center, we personally have been moved many times by the resiliency and desire that our participants show in order to improve their current health status. Everyone has different physical capabilities, and while we might not all go on to tell the world of our trials and triumphs like James, you never know how your determination to work through physical adversity, may not only improve your health, but also inspire others. Carolyn Mueller, MS, CPT, is the Manager of Fitness Services and Austin Bruhl is an Adaptive Fitness Intern at the Rehabilitation Institute of Chicago. For more, visit www.ric.org.